While going on a trip is almost always an incredibly enriching and relaxing experience, it is also an investment of your time and money. We want you to have peace of mind when you travel with us and know your investment is well protected. This is why it is a good idea to purchase travel insurance to make sure you are covered in any unforeseen circumstances. 1.It’s 10 p.m. and you and your immediate family arrive at the airport for a connecting flight, only to find that your flight has been cancelled. Who can assist you with finding new flights to get everyone home? 2.Your bag was lost with your insulin inside. You need help to locate your bag as soon as possible and have your emergency prescription filled. Who do you call? 3.Your first visit to Europe, and your passport and wallet are stolen. Where do you turn for emergency cash, and how will you get your passport replaced? 4.You’re involved in an accident and adequate medical treatment is not available. Who will help arrange and pay for a medical evacuation? 5.If your sister-in-law becomes seriously ill and you must cancel your trip, what happens to your non-refundable deposits or pre-payments? 6.You arrive in Jamaica and your luggage doesn’t. If it’s lost, who will help you find it? If it’s delayed, who will pay for your necessities? If it’s stolen, who will pay to replace it? 7.Your cruise line, airline or tour operator goes bankrupt. Who will pay for your non-refundable expenses? Who will help get you to your destination? 8.You’re walking down a street in Rio and twist your ankle. Who can help you find an English-speaking physician? 9.Three weeks before your scheduled arrival, a terrorist incident occurs in the city to which you are planning to visit. Who will pay if you want to cancel your trip? 10.You are at a beach resort in North Carolina, and you are forced to evacuate due to an approaching hurricane. Who will help you evacuate and who will reimburse your lost vacation investment? While most trips have a happy beginning right through to a happy ending, we want you to have peace of mind when you travel with us and know your investment is well protected. No matter who you buy from – please consider trip insurance before you travel. Spirits of the Earth recommends and offers Travel Guard travel insurance. Please click on the image below for a complimentary, no obligation quote. Q. Why should a traveler buy travel insurance? A. Travel insurance gives travelers coverage for unforeseen problems, from a cancelled flight to a serious illness or in rare cases, even an act of terrorism or the financial default of a travel supplier. If an illness, accident, or other covered unforeseen circumstance forces a traveler to cancel or interrupt their plans, they face two major financial loss money invested in nonrefundable pre-payments, and medical expenses that in many instances may not be covered by health insurance. Q. What happens if a traveler must cancel their vacation? A. Often a traveler will lose nonrefundable deposits and prepayments that can add up to hundred or even thousand of dollars. A comprehensive travel insurance plan through Travel Guard can provide trip cancellation coverage for the traveler’s vacation investment the insurance company reimburses the traveler for all pre-paid, nonrefundable expenses for a covered loss. Q. How does trip cancellation and interruption coverage work? A. It reimburses for forfeited, nonrefundable, unused payments or deposits if the traveler must cancel or interrupt their trip due to a covered reason. Q. What other coverage is typically included in a Travel Guard travel insurance plan? A. In addition to trip cancellation and interruption, the more comprehensive travel insurance plans available today may also cover emergency medical expenses; emergency medical transportation, when ordered by a doctor, to the nearest adequate medical facility; reimbursement for accommodations and expenses incurred due to travel delays; reimbursement for the purchase of essential items if baggage is delayed; and coverage against lost, stolen or damaged baggage. Q. Does travel insurance cover terrorism? A. Many travel insurance policies do not cover terrorism, or only cover terrorist acts that occur on foreign soil. Travel insurance through Travel Guard can cover terrorist incidents both in the United States and abroad. Q. Is the financial default of an airline, cruise line or tour operator covered? A. All of Travel Guard’s retail insurance programs include financial default coverage if the program is purchased within 15 days of making the initial trip deposit. Q. Does Travel Guard offer travel insurance plans tailored to specific types of travel? A. Yes. 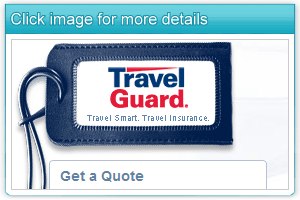 Travel Guard offers travel insurance plans for an array of budgets. In the quote we provide (see link above) we offer three of their best plans. However, please don’t hesitate to contact us for a full list of the plans they offer. Q. How much does travel insurance cost? A. The cost of travel insurance is based, in most cases, on the value of the trip and the age of the traveler. Typically, the cost is five to seven percent of the trip cost. Q. What else is offered with the purchase of a Travel Guard plan? A. To boost travelers’ confidence when traveling, Travel Guard has added “LiveTravel” assistance, which provides 24-hour, “911″ emergency travel agency-type services to all standard retail plans, in case a traveler has to change a flight or a hotel room. Travel Guard has also added assistance with emergency cash transfers, pre-trip consultation services (travel advisories, passport requirements, inoculation information, etc. ), and live messaging, which will relay any e-mail or phone message to family, friends or business associates. If you need immediate emergency travel assistance please contact Travel Guard at 715.345.0505 (International Collect). *Coverage varies by program purchased. Actual coverage is determined by policy. The information provided is informative in nature only.